Shannon helps kick off our newest series, Artsville Saturday Nights. Think house concerts, but a little bigger. All the intimacy of an Artsville event combined with the unique atmosphere of The Midnight Rooster. Save on advance tickets. Reserve a table for you and your friends. Or grab a 3-show pass and catch all the great music of the inaugural season of Artsville Saturday Nights. Don't miss your chance to Stay In and Go Out. Learn more about the series here. Click below to get your tickets now. Artsville Saturday Nights posters and postcards are going up this weekend. Help us hang some, and get a free ticket! Click here to sign up for our street team. Just interested in buying a ticket? They're available now here. 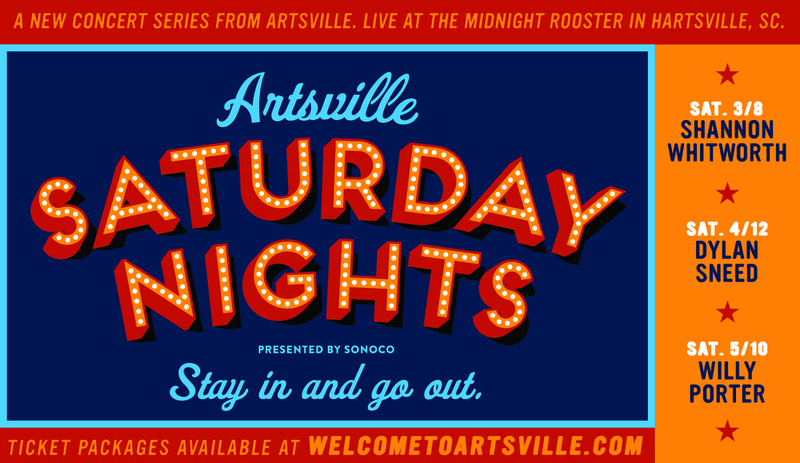 Ticket packages for our brand new series, Artsville Saturday Nights, go on sale Monday, February 3. Save almost 15% by picking up a 3-show pass! Single tickets and reserved tables will also be available on Monday for our first show, featuring soulful Americana songwriter, Shannon Whitworth, Saturday, March 8. Read up on the series here. Read up on Shannon Whitworth here.